The basal joint at the base of the thumb near the wrist, also called the thumb CMC (carpometacarpal) joint, allows the thumb a wide range of motion. Basal joint arthritis is a relatively common condition, even if a person does not suffer from arthritis in any other joint. Normal use of the thumb throughout life wears out the cushioning cartilaginous surfaces that protect the bone ends that move against each other within the joint. As the cartilage gets worn away, friction between the bone surfaces causes inflammation and pain, the condition known as osteoarthritis. Trauma, such as a fracture or sprain, can increase the risk of developing basal joint arthritis, as can performing certain activities that place extra stress on the joint. Your doctor will physically examine your thumb, and move the joint in various directions to determine what causes pain, a gritty feeling, or even a grinding sound. You may be asked to grasp or pinch objects to assess hand function. X-rays may be taken to confirm the diagnosis. A mild case of basal joint arthritis can be treated with conventional (non-surgical) methods. Heat or cold treatment can help to reduce swelling and pain. Sometimes it is helpful to alternate between the two. Acetaminophen (Tylenol) or NSAIDs such as ibuprofen (Advil) or naproxen (Aleve) can be taken to relieve pain and reduce swelling. Your doctor might prescribe stronger pain medication if needed. Your doctor may suggest that you wear a splint that supports the wrist and thumb. This will allow the joint to rest while keeping it in its proper position. The splint can be worn just at night or during the day as well, if needed. If using a splint and taking pain medication does not relieve your symptoms, you may be given a corticosteroid injection directly into the joint. These are very effective and can be administered up to three times a year. For persistent and debilitating pain and loss of hand function, surgery may be the best option. Your doctor would help you choose the most suitable procedure for your case. Range of motion exercises can help to maintain and improve the mobility of your thumb joint. Lift your hand with your palm facing inward. Slide your thumb against your palm, toward your little finger, and bend your thumb at the base to maximize the stretch. Then lift your thumb straight up toward the ceiling as high as it will go. Now bring it to rest against your index finger and then move it sideways, as though trying to make an 'L' shape. Rest and repeat. Lift your hand with the palm up. Keeping the wrist straight, touch your thumb to the tip of each finger in turn. Rest and repeat. The hand has many small joints that allow us to make fine motor movements. With time or overuse, these joints can become inflamed, making normal daily activity difficult. Arthritis is inflammation of the joints. There are many different types of arthritis, but two of the most common are osteoarthritis and rheumatoid arthritis. Osteoarthritis is often known as ‘wear and tear’ arthritis. The protective cartilage that covers the ends of the bones is gradually worn away, leading to bone grinding on bone, which causes inflammation and pain. Rheumatoid arthritis is a disease that causes the synovial lining of a joint to swell, which leads to pain, but also stiffness in the joint. Trauma, such as a fracture, meniscus tear, or injury to a ligament can make a joint more susceptible to developing arthritis similar to osteoarthritis. Symptoms usually begin slowly, with a dull, sometimes burning sensation, noticeable particularly after increased use of the joint. These symptoms, along with stiffness, can be worse in the mornings. If you suspect you may be developing arthritis, it is important to get early treatment to enable you to continue your normal activities. Nonsurgical treatment can include injection, splinting, and medication, and your treatment will be based upon your particular condition. Injection: These are generally a combination of a long-lasting anesthetic and a steroid, which can give relief from pain for a period lasting months. Possible side effects such as weakening of tendons and ligaments, or infection, limit the use of injections to only a few times. Splinting: This treatment is usually combined with injections. The splint supports the hand by reducing stress placed upon the affected joints. A splint can be worn during periods of joint pain, but not for too long as overreliance on the splint can lead to deterioration of the muscles. As muscles support and stabilize joints it is important to keep them strong. Medication: These are anti-inflammatories such as acetaminophen or ibuprofen, which help to reduce the body’s inflammatory response of swelling and pain. Many people take glucosamine (a neutraceutical, not a drug) for arthritis, although they have not yet been studied for their effectiveness in helping hand arthritis. If you wish to try neutraceuticals or any other dietary supplement, please consult your doctor as they can sometimes cause negative reactions with prescribed drugs. Surgery: If nonsurgical methods fail to provide relief, surgery may be considered. The affected joint may be preserved, reconstructed or, if the joint is beyond repair, a replacement or fusion might be performed. Ideally, the joint will be preserved. This can be dependent on early diagnosis. Arthroscopic surgery (a technique using small incisions and tiny, precise instruments) is becoming more common and has the benefit of a faster recovery time due to the lesser overall trauma of the procedure. A fusion will eliminate pain, but the joint will no longer function. Surgery to replace a hand joint is similar to a hip or knee replacement, with the replacement joints being made from long-lasting materials. Postoperative treatment consists of splinting the hand temporarily, pain relief through medication, and physical therapy to regain maximum use of the hand. Bursitis is the inflammation of a bursa, a thin, fluid-filled sac that lies between body tissues or structures to allow them to move against each other without friction. If the bursa is injured or inflamed it swells with excess fluid, reducing the space within which other tissues move and leading to friction, irritation, and pain. The main bursae in the hand are the ulnar bursa and the radial bursa, which form protective sheaths around the tendons that run from the wrist into the hand. The main cause of bursitis is repetitive movement. Other causes include prolonged or excessive pressure, injury, or conditions such as rheumatoid arthritis. Open wounds around the area, redness and warmth of the skin, or fever, chills, or sweats could be symptoms of an infected bursa. Seek medical attention immediately for any such symptoms. Bursitis is mainly diagnosed through a medical history and a physical examination performed by your doctor. Blood tests, X-rays and MRI (magnetic resonance imaging) scans normally are only taken if another condition suspected, such as a fracture, arthritis or calcium deposits. If an infected bursa is suspected, the doctor will remove some fluid from the bursa (through a simple procedure known as needle aspiration) and send it to the lab for analysis. Bursitis is usually treated with conservative (non-surgical) measures that you can administer yourself. Rest your hand: in particular, avoid any movement that makes the pain worse. You might want to immobilize the wrist temporarily by using a sling or padded splint. Crushed ice, in a bag wrapped in a towel, will help to reduce the inflammation and therefore the pain. Ice can be applied several times a day for as long as is comfortable. There are wraps containing gel packs available for purchase. The gel pack is cooled in the fridge and placed in the wrap, which is then applied to the wrist area. After a couple of days or cold therapy, the application of heat may help. Heat brings healing oxygen and nutrients to the injured area. Over-the-counter medication such as NSAIDs (non-steroidal anti-inflammatory drugs) such as Advil, Motril, and Aleve will relieve inflammation and pain. If your symptoms continue, your doctor may inject cortisone directly into the bursa. This provides rapid relief, but can only be administered a few times a year to avoid damage to the tendons. Any infection would be treated with antibiotics and, if necessary, surgical drainage of the bursa. Chronic bursitis might require the surgical removal of the bursa, but normally bursitis subsides within a week or two of beginning treatment. Hold a small weight (such as a can) in your injured hand, palm facing up. Bend your wrist slowly up and then down to the starting position. Repeat 10 times for 1 set. Do 3 sets. Gradually increase the weight. Hold a small weight (such as a can) in your injured hand, palm facing down. Bend your wrist slowly up and then down to the starting position. Repeat 10 times for 1 set. Do 3 sets. Gradually increase the weight. Hold a rubber ball in your injured hand and squeeze it. Hold the squeeze for 5 seconds. Repeat 10 times for 1 set. Do 3 sets. A fracture is a broken bone. The bone may be only cracked, or it may be broken into two or more pieces. Each finger has three bones, the proximal (nearest the knuckle), middle, and distal (fingertip) phalanges. Joints are formed where the ends of the bones meet, to allow for finger movement. Fractures can occur at any point along the finger and may or may not involve a joint. The main cause of a broken finger is trauma. The finger sustains a direct injury, whether it has been crushed, hit or jammed. Sometimes a fracture can occur when the finger is forcibly twisted and pulled. Very occasionally, a tumor or cyst can weaken the bone enough for it to break. If you suspect you have a fractured finger you should seek medical attention. Failure to get proper medical attention can result in long-term problems with pain and stiffness in your hand. X-rays are normally used to diagnose a finger fracture as they can show the exact location and severity of the break. keeping the finger elevated when possible. Using a sling will help and, when sitting or lying down, prop your hand up on a pile of cushions or pillows. taking acetaminophen (Tylenol) or NSAIDs such as ibuprofen (Advil) or naproxen (Aleve). Your doctor will recommend the best treatment for your fracture. Depending on the severity of the fracture, recommended treatment may involve exercising the finger immediately, or wearing a splint or cast on the finger to provide support and limit movement to allow the bone to start healing. In some cases, surgery may be needed to realign the bone pieces and hold them in position during healing. When the time is right, usually after wearing a splint is no longer necessary, performing rehabilitation exercises will restore mobility to the finger joint. With your good hand, gently bend your injured finger and hold for 5 seconds. Gently straighten it and hold for 5 seconds. Do 10 times, 3-5 times a day. With your thumb and injured finger, pick up various small objects like coins, buttons or pins. Do this exercise often. Place the palm of your injured hand flat on a table, with your fingers straight. In turn, lift each finger straight up, holding for 5 seconds before lowering. Do 10 times, 3-5 times a day. Squeeze a soft rubber ball and hold the squeeze for 5 seconds. Repeat 10 times for 1 set. Do 2 sets, 3-5 times a day. Gamekeeper’s thumb, also known as skier’s thumb, is an injury to the ligament of the metacarpophalangeal (MCP) joint of the thumb. The joint is formed at the junction of the bones at the base of the thumb, that is, the head of the first metacarpal of the hand and the base of the first phalange of the thumb, in the area known as the web space. The joint is supported and held in position by ligaments on either side of the joint, plus the ulnar collateral ligament that restricts the amount of sideways movement of the thumb, away from the hand. The ulnar collateral ligament is used whenever you grip or hold an object. The injury first got its name because it was commonly found in Scottish gamekeepers who used to regularly break the necks of rabbits in such a way that the force required gradually weakened the ligament and resulted in a painful, unstable thumb joint. Nowadays the injury is much more likely to be an acute injury, often found in skiers as a result of a fall or catching the thumb in the ski pole loop. The specific movement that produces gamekeeper’s thumb is the forceful abduction of the thumb, which means the movement of the thumb away from the index finger. This can tear the ligament and sometimes causes a small fracture of the metacarpal as the ligament tears away a chip of bone. This is known as an avulsion fracture. 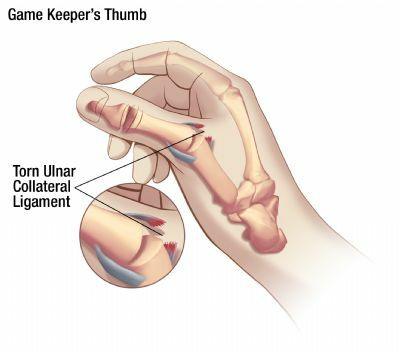 Gamekeeper’s thumb is typically a chronic injury to the ulnar collateral ligament, while skier’s thumb best describes an acute injury. The terms are often used interchangeably. Gamekeeper’s thumb is caused by a force that pushes the thumb sideways, away from the hand, beyond its normal range of motion. This may occur as a result of a fall, but this common injury often happens during participation in sports. Skiers, football players, and hockey players are particularly at risk. Early diagnosis is important in order to achieve the best results from treatment. Failure to diagnose the injury, or a decision not to treat it, will almost certainly result in permanently impaired thumb function. Proper treatment leads to a complete resumption of normal activity in nearly every case. Your doctor will ask you about your medical history, any previous injuries to your hand or thumb, your general level of activity, the circumstances of your current injury, and the type and severity of your symptoms. Your thumb and hand will be physically examined. Your doctor will need to assess the stability of the joint. If your thumb joint is very painful the doctor may inject the area with some local anesthetic so your thumb can be manipulated in particular ways to aid with diagnosis. X-rays will probably be taken to see if there is a bone fracture, and an MRI (magnetic resonance imaging) scan may be needed to view the soft tissues. Gamekeeper’s thumb can be difficult to correctly diagnose, particularly if no fracture is present. A condition called a Stener lesion, where a tendon gets caught between the torn ligament and its normal place of insertion on the bone, prevents the ligament from healing. This condition would not necessarily be clear on an X-ray, which is why an MRI may be necessary. Treatment depends on the severity of the injury, your age and physical requirements, and how long before diagnosis the injury was sustained. Initial treatment should consist of applying crushed ice, in a bag and wrapped in a towel, to the injured area. Ice can be applied for as long as is comfortable, several times a day. NSAIDs (non-steroidal anti-inflammatory drugs) will help with pain and inflammation, as can anti-inflammatory gel. Elevating the hand above the level of the heart will reduce swelling. For a moderate injury (Grade I or Grade II) with a relatively stable thumb joint, the wrist might be placed in a cast or type of splint (thumb spica) for four to six weeks while healing takes place. If there is a fracture but the bone fragment is only minimally displaced, the joint may also be splinted. Over 90% of these injuries heal extremely well. Exercises to rehabilitate the thumb joint would begin when medically appropriate, but typically after six weeks of splint wearing. One of the most helpful exercises is to squeeze a soft ball or rolled sock. Do not begin rehabilitation exercises without your doctor’s approval, in order to avoid further damage to the joint. Physical therapy may include ultrasound and massage as well as exercise. More severe injuries resulting in extensive or complete ligament tearing and a significantly unstable joint will most likely require surgical repair. Surgery is most effective for gamekeeper’s thumb when performed within a few weeks of the injury. The goal of surgery is to restore strength and stability to the thumb joint. The torn ligament ends would be sewn back together, if possible, or stitched to the bone. If too much time has elapsed since the injury it is unlikely that repair of the ligament would be possible, so the ligament might be reconstructed using other tissues such as a tendon, or a muscle at the base of the thumb might be extended. Following surgery a cast or splint would have to be worn for up to six weeks. You would be advised when to begin exercises to increase the range of motion of the thumb, followed by strengthening exercises. A return to sports is normally possible about three or four months after surgery. It might be advisable to tape the thumb, at least when first returning to sporting activity. Occasionally there may be some residual instability of the thumb, which may lead to premature development of arthritis. Any stiffness or numbness is likely to gradually resolve with time. A ganglion cyst is a swelling, balloon-like in shape and on a stalk, that arises from a joint or the sheath of a tendon, and is usually found on the hand or wrist. Inside the cyst is synovial fluid, a clear, colorless substance that becomes gel-like with time. Synovial fluid is the same substance as that found within a joint capsule. Ganglion cysts are benign, that is, they are non-cancerous, and will not spread to other parts of your body. They may well change in size, depending on how active the joint is, and they are unsightly, but they are not dangerous. The wrist joint on the back of the hand is the most common place to find a ganglion cyst. They can also occur on the underside, or palm, side of the wrist. Less common sites are on the palm at the base of the fingers, where they tend to be about the size of peas, just below the cuticle on a fingertip, when they are known as mucous cysts, and occasionally on the top of the foot or outside of the knee or ankle. They are sometimes referred to as ‘bible cysts’. This name comes from the old practice of thumping the cyst with a heavy book in order to break the capsule and release the fluid. Such treatment is not recommended these days due to the risk of inflicting further damage. Women are slightly more prone than men to getting ganglion cysts, and they tend to be more common in gymnasts. Almost three quarters of sufferers will be aged 20-40. Having osteoarthritis can increase the likelihood of developing a cyst as such a condition often leads to greater amounts of synovial fluid in the joints, which can then leak out. Although there is no definite known cause, one theory is that an abnormality in the joint capsule, or in the tendon sheath, allows the synovial fluid to escape and form a cyst. Another theory is that a trauma such as a hard blow to the hand causes fluid to form into several small cysts, which then join together to form one larger cyst. It is generally agreed that the more active a joint is, the bigger the cyst will become and that cysts fill with fluid more easily than they empty. A bump that changes in size, increasing with activity and decreasing with rest. Oval or round in shape, ranging from soft to firm. The bump does not move around. Sudden appearance of the cyst, or gradual onset, or disappearance followed by reappearance is possible. Many ganglion cysts are painless. It is only if the cyst is pressing on the nerves that pass through the joint that pain is felt. Constant, aching pain that is worse with movement. Pain, but no visible lump, may indicate an occult, or hidden, cyst. Cysts at the base of the finger tend to be very firm, pea-sized and tender under pressure. Possible weakness in a finger, if the cyst is connected to a tendon sheath. Numbness or tingling of the hand or finger. Although ganglion cysts are harmless and usually disappear without any treatment, it is a good idea to have it checked by your doctor, just to rule out any other conditions that may produce similar lumps. Your doctor will ask questions about your general health and lifestyle, and questions relating to your symptoms. You will be asked about the circumstances surrounding the appearance of the bump, any changes you may have noticed, and whether you feel any pain and if so whether that pain is better or worse with movement of the joint. The bump will be physically assessed, possibly pressed and the joint gently manipulated to see if that causes discomfort. Light might be shone through the lump to see if it is filled with fluid, a procedure called transillumination. Sometimes a needle will be used to aspirate, or withdraw, some of the fluid for evaluation. If the diagnosis is not clear, an x-ray might be needed to rule out other conditions. Ultrasound might be used to determine if the bump is fluid-filled or solid or perhaps caused by a blood vessel. Ultrasound and MRI (magnetic resonance imaging) are useful tools to see occult cysts, if they are suspected. As most ganglion cysts gradually go away by themselves, conservative treatment is usually followed. Often your doctor will advise you to observe the cyst and return for treatment if your symptoms become worse or you are losing function of the joint. Do not be tempted to hit the bump with a heavy book as this can cause injury to the hand. Do not ‘pop’ the bump as this can lead to infection. Over the counter medications can provide relief from pain until the cyst shrinks. NSAIDs such as ibuprofen (Advil), aspirin or naproxen (Aleve), or acetaminophen (Tylenol) will reduce pain and inflammation. Avoid movements that make the pain worse. Using a splint temporarily will immobilize the joint and allow fluid to drain from the cyst, which will reduce pressure on the nerves and so decrease pain. However, it is not a good idea for the joint to remain immobile for too long. Aspiration of the cyst is a common treatment. A numbing agent is injected near the site of the cyst, and then a needle is used to drain fluid. This procedure reduces the size of the cyst and relieves any painful symptoms. However, because aspiration leaves the shell and stalk of the cyst intact, it often refills at a later time. Also, if the synovial fluid has become very gelatinous, it is sometimes difficult to withdraw it through a needle. After aspiration an injection of an anti-inflammatory steroid is administered into the joint, and then a splint applied. Surgery is sometimes needed if the cyst continues to be problematic, causing a lot of pain, numbness or tingling or preventing normal function of the hand. Surgery removes the cyst, along with a piece of the joint capsule or tendon sheath. It is the most effective treatment for a ganglion cyst, but does not guarantee that the cyst will not return. After surgery a splint is applied for 7-10 days, after which time movement of the joint is encouraged. The best splint for you will depend on the position of your cyst, but it will need to be comfortable and supportive enough to prevent movement of the joint. Because the exact cause of a ganglion cyst is not known, it is not possible to effectively prevent their occurrence. A stroke happens when the blood supply to the brain is temporarily cut off, depriving the brain of oxygen. Depending on the severity of the stroke, the patient may experience numbness and weakness on one side of the body. Hand coordination and strength may be affected, but with time and rehabilitation, good hand function can often be restored. A stroke is a medical emergency, and you should seek immediate medical attention if you experience any stroke symptoms. Early treatment is crucial to recovery. Diagnostic techniques for stroke include angiogram, CT, ultrasound, echocardiogram, electrocardiogram, MRA (magnetic resonance angiography), and lab tests. If you have been diagnosed as having suffered a stroke you will have been given the appropriate treatment in hospital. Various therapies, depending on your specific needs, will also have been started to begin the rehabilitation process. You will be encouraged to perform finger and hand exercises to develop good coordination. This takes time and patience, because the problem lies not in the muscles of your hand, but within the brain. When you do the exercises you are retraining your brain. Be patient with yourself. Place the palm of your hand flat on a table, with your fingers straight. In turn, lift each finger straight up, holding for 5 seconds before lowering. Do 10 times, 3-5 times a day. Place the palm of your hand flat on a table. Spread out your fingers as far apart as you can, then bring them together again. Do 10 times, 3-5 times a day. Touch the tip of each finger, in turn, to the tip of your thumb. Concentrate on getting each finger to work individually. Lift your hand with your palm facing inward. Slide your thumb against your palm, toward your little finger, and bend your thumb at the base to maximize the stretch. Then lift your thumb straight up toward the ceiling as high as it will go. Now bring it to rest against your index finger and then move it sideways, as though trying to make an ‘L’ shape. Rest and repeat. Choose about 5 or 6 objects ranging in size from a tennis ball to a button or pin. Starting with the largest object, pick it up. Then pick up the next in size, working your way to the smallest. Even if you can’t pick up the smaller objects to begin with, with time you will. 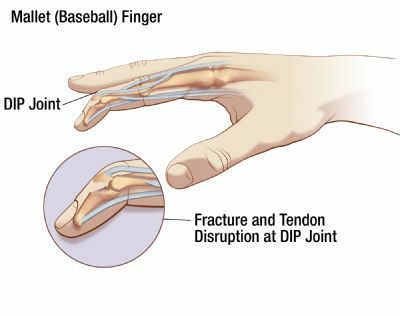 A mallet finger, also known as a baseball finger or dropped finger, is caused by an injury to the extensor tendon on the back of a finger or thumb. The tendon attaches bone to muscle and is necessary for straightening the finger. If the tendon is damaged at the point of attachment to bone, just behind the fingernail, the ability to straighten the finger at the joint is lost and the fingertip will droop down. Often a small fragment of bone, and occasionally a large piece, will be torn off with the tendon at the time of injury. An athletic injury is the most common cause of a mallet finger, although other circumstances can produce the same damage. A ball or other object striking your fingertip and forcing it down, while you are trying to straighten the finger, can stretch or tear the tendon. Pain at the moment of injury, lessening with time. Swelling around the injured joint. Tenderness at the site of injury, just behind the base of the fingernail. Drooping of the fingertip. The finger may be straightened with assistance, but is unable to hold the position unaided. Sometimes there might be blood under the nail. Sometimes the nail might be detached from the nail bed, under the skin at the base of the fingernail. If there is blood under the nail, or a detached nail, seek medical assistance immediately as there may be an open cut, or possibly a compound fracture, which is when a broken bone has pierced through the skin. Infection is a grave danger in such circumstances. It is important to see a doctor and get treatment for a mallet finger because, although it may not be terribly painful, without treatment the injury may be made worse, and could result in permanent disability. An injury older than three months will not improve without surgery. Make an appointment to see your doctor within one week of the injury. If the injury has happened to a child, bone-forming cartilage may have been damaged. Treatment will be essential to avoid possible stunting or deformity of the finger. Before your appointment, there are some first aid treatments that you can carry out to improve symptoms and begin the healing process. Temporarily splint the finger, using something like an ice cream stick taped to the finger, until you can see the doctor. Immobilizing the joint is very important. Apply ice, crushed in a bag and wrapped in a towel, to the finger for 15-20 minutes at a time, 3-4 times a day, for the first 1-2 days. Keep the finger elevated above the heart whenever possible. This will help reduce swelling, which will ease pain. When sitting or lying down, prop the hand up on a pile of cushions or pillows. Over the counter medications such as acetaminophen (Tylenol) or NSAIDs such as ibuprofen (Advil), naproxen (Aleve) or aspirin, will help reduce pain and swelling. Your doctor or other health care provider will order an x-ray to see if any pieces of bone have been pulled away with the tendon and if surgery will be necessary. In most cases surgery is not required. Treatment for a mallet finger usually consists of splinting the finger continuously for 6-8 weeks, followed by a gradual reduction in the use of the splint. Rehabilitation exercises might be required to restore mobility in the joint. Such treatment is normally very successful, although full extension of the joint may never be regained. Keeping the joint immobilized for the full course of treatment is essential. If the tendon is allowed to stretch at all during this time, treatment has to begin all over again. The splint will only immobilize the injured joint, so the rest of the finger will be allowed to bend normally. Try to avoid getting the splint wet as the skin underneath the splint might suffer if unable to dry. Surgery might be required if there is a large bone fragment present, severe joint misalignment, or if non-surgical treatment has failed. The procedure might include using pins, wire or small screws to repair the joint and reattach the tendon. Sometimes the joint might have to be fused. Any exercise to restore mobility to the injured joint is only to be undertaken after complete healing has taken place. Get your health care provider’s permission before removing the splint or doing exercises in order to avoid having to begin treatment again. When it is allowable, the following exercises will help rebuild strength and flexibility. Gently try to straighten the fingertip. If it needs assistance, hold it with your other hand and carefully straighten it as far as it will go. Don’t force it. Hold it in position for 5 seconds, then release. Repeat 10 times, 3-5 times a day. Try to make a fist with the injured hand. If this is difficult, use the other hand to help, but be gentle. Hold the hand in a fist 5-10 seconds, then release. Repeat 10 times. With the injured finger and your thumb, practice picking up small objects. Repeat several times. With your hand on the table, palm down and fingers outstretched, try to lift one finger up. Hold the extension for 5 seconds, then rest. Repeat for each finger. Repeat 10 times a day. Hold a rubber ball in your hand and gently squeeze it. Hold the squeeze for 5 seconds, then slowly release. Repeat 10 times for 1 set. Do 3 sets. As your finger will be in the splint continuously for up to 8 weeks, comfort is very important. The splint should be attached firmly enough to prevent any movement of the joint, but not so tight that the finger feels constricted. The material of the splint should allow the skin to breathe, and it should be constructed to avoid chafing. Ease of cleaning is another aspect to consider when choosing a splint. Wear protective gloves when playing ball sports, if possible. Rheumatoid arthritis is an autoimmune disease causing inflammation and damage to the joints. It is often a progressive condition that starts in the hands and feet, mostly usually in the wrist and knuckles, before spreading to other joints in the body. A joint is formed at the junction of two articulating bones. The end of each bone is covered with cartilage, a smooth, slippery coating that protects the bones as they slide across each other. Around the joint is a strong membrane that encloses the joint parts in a capsule. The capsule has a thin, membranous lining, the synovium, which secretes synovial fluid to lubricate and provide nutrients to the cartilage. Outside the capsule are ligaments and tendons that keep the bones in their proper alignment. In the case of rheumatoid arthritis (RA), the body’s immune system reacts inappropriately to an external trigger. Substances that irritate the synovium are secreted, causing it to become thicker with resultant swelling, redness and pain. This disease can eventually destroy bone and cartilage in the joint. It can also stretch the tendons and ligaments so that the joint becomes misaligned and deformed. There is thought to be a hereditary aspect to rheumatoid arthritis. Having a family member who suffers from this condition does not mean that another member will automatically develop it. However, it is believed that an individual can have a genetic predisposition making that person vulnerable to certain viruses or bacteria that may trigger the onset of the disease. Therefore, if there is a family history of RA, you are at increased risk. If you are female you are up to three times more likely to develop it, and if you smoke you are even more vulnerable. Although RA can develop at any stage of life, it tends to affect people between the ages of 40-60. Symptoms can come and go and have varying degrees of severity. Times when the disease is active are known as ‘flare-ups’. They can often be interspersed with periods of remission when symptoms are much reduced or non-existent. When symptoms appear, they tend to be symmetrical, that is, present in the same places on both hands. Aching pain in the joint. Warmth and swelling around the joint. Redness and puffiness of the hand. Stiffness and loss of range of motion, especially in the morning, and lasting longer than one hour after getting up. Firm bumps under the skin on the fingers or elbow (rheumatic nodules). Soft lump on the back of the hand that moves as the fingers straighten. Tiredness, low fever, appetite or weight loss. Fingers start to angle away from the thumb. Sudden inability to bend or straighten a finger due to tendon rupture. The middle joint of the finger is bent upwards. The middle joint is bent downwards and the joint nearest the nail bent upwards. Numbness or tingling in the hand. Squeakiness when the joint is moved. Snapping or locking of the joint. Your doctor will take your medical history, which will include questions about any family history of rheumatoid arthritis, your symptoms and whether your daily activities are being affected. Your hands will be assessed, with attention paid to any redness, swelling, loss of range of motion, joint deformity or nodules under the skin. There is not one definitive test to confirm the existence of RA, but laboratory tests can point to a positive diagnosis. Blood, urine and synovial fluid can be analysed for particular antibodies and proteins that indicate the presence of the disease. X-rays are often used to view the condition of the joint, and sometimes an MRI scan is performed to provide particular detail. Unfortunately there is no cure, but treatment can relieve symptoms and help to improve function of the hands. NSAIDs (non-steroidal anti-inflammatory drugs) can be taken orally, or as creams or gels to be applied topically. DMARDs (disease-modifying anti-rheumatic drugs) slow or stop the immune system attacking. Biologics are often used in conjunction with DMARDs. They target specific proteins that are involved in an immune response. Corticosteroids can be used to reduce inflammation and suppress the immune system. Immunosuppressants calm an immune response. TNF-alpha inhibitors suppress an inflammatory substance. A hand therapist will assist you by finding devices to help with daily activities such as picking up objects or opening jars. Sometimes a splint to be worn during the day or at night might be recommended. Exercises can be taught to maintain and increase mobility in the hands. TENS (transcutaneous electrical nerve stimulation). This treatment interferes with pain signals being sent to the brain. Counter-irritants such as menthol or capsaicin in ointment can also interrupt pain signals. The medicinal herbs thunder god vine, evening primrose, borage and blackcurrant have been found to ease symptoms, as have fish oils, but always check with your doctor first. If taken with certain prescribed medicines there can be dangerous interactions. Sometimes your doctor might feel that surgery would be the best option for you. A ruptured tendon can be repaired, the synovium removed, or a joint fused, any of which will relieve the symptoms associated with rheumatoid arthritis. Exercise can increase range of motion and flexibility of the joints. Tai chi, swimming and water aerobics are recommended. Hand exercises such as those listed below should be done on a daily basis, provided they do not cause new pain. Soaking the hand in warm water for 4 minutes, then in cool water for 1 minute, repeated for half an hour and ending with a warm soak, has been found to ease pain. These are to be done with the approval of your doctor, and should not cause you pain. They are designed to increase flexibility and mobility, not strength. Relax your hand. With the fingers together and straight, and without moving the wrist and knuckles, bend the fingers at the end and middle joints. Slowly return the fingers to the starting position. Repeat with the other hand. Do this several times. Start with your fingers spread out straight, then slowly form a loose fist and place your thumb around the outside the fingers. Don’t squeeze hard. Slowly return to the starting position. Repeat with the other hand. Do this several times. Gently spread your fingers as far apart as you can, without forcing them. Relax the fingers and slowly bring them together before spreading them out wide again. Repeat with the other hand. Gradually increase the number of times you do this exercise. With your fingers and thumb straight, touch the thumb to the pad on your palm, just below your little finger, or as far across your palm as you can. Return your thumb to the starting position, then touch the tip of each finger, in turn, to the thumb, forming an ‘O’ shape. Straighten each finger after touching the thumb. Repeat with the other hand. With the palm down on a table and the fingers slightly spread out, and keeping the wrist and thumb still, lift and move the index finger toward the thumb. Repeat with each finger in turn. Repeat with the other hand. Do this exercise several times. Working splints and resting splints are available to reduce swelling, ease pain and prevent joint deformity. Although studies have not found conclusive evidence that they are effective, patients prefer wearing them to not wearing them, so there is some apparent benefit. Padded resting splints were found to be more comfortable than unpadded. Swan Neck Deformity is a condition characterized by the unusual contraction of a fingertip, caused by a hyperextended proximal (nearest the knuckle) interphalangeal joint (PIP joint) and a flexed distal (furthest from the knuckle) interphalangeal joint (DIP joint). Running down from the muscles of the forearm to the fingers are tendons that eventually flatten and branch out over the top of the finger to connect with the middle and end bones of each finger. When the extensor muscles in the forearm contract they pull on the extensor tendon and straighten the finger. Within each finger joint are ligaments, bands of strong, elastic tissue that hold bones in position and allow for limited movement. The strongest ligament in the PIP joint is the volar plate, which prevents the PIP joint overextending and getting damaged. If the volar plate does become damaged or weakened, Swan Neck Deformity can occur. Any condition that loosens the PIP joint can lead to Swan Neck Deformity. Rheumatoid arthritis is a common culprit as the chronic inflammation of the joint stretches the volar plate. The more the volar plate stretches, the more the joint can hyperextend. This causes the DIP joint to be pulled downwards, leading to the characteristic bent finger shape of Swan Neck Deformity. Other causes can include trauma to the muscles of the hand and fingers, or conditions such as Parkinson's disease, stroke, or cerebral palsy. A diagnosis of Swan Neck Deformity is usually apparent from a physical examination. To check the condition and alignment of the finger joints, or to rule out a fracture, an X-ray may be taken. If the PIP joint is supple, non-surgical treatment may be successful. The finger must be properly realigned and the joint restored to its normal range of motion. Treatment normally consists of wearing a splint for six weeks that prevents the joint hyperextending while still allowing it to bend. Physical therapy to restore joint flexibility is also important. If these measures fail to resolve the condition, surgery may be considered. Surgery for Swan Neck Deformity is not always successful but consists of releasing the tissues around the PIP joint and realigning them in balance with all the finger structures. Occasionally, if the PIP joint is stiff, the joint has to be completely replaced. Another option for chronic Swan Neck Deformity is fusion of the DIP joint. This makes the joint stable, but obviously eliminates the ability of the joint to move. Stretching and strengthening exercises are important components of rehabilitation. After surgery you would wear a splint for 3-6 weeks, and then begin therapy to gradually increase the joint's range of motion, followed by stretching and strengthening exercises. Standing up, bend your elbow to a 90-degree angle. Rest the arm of the affected finger against your body. Spread your fingers as wide as you can. Hold for 5 seconds then bring them back next to each other. Do 10 repetitions for 1 set. Do 3 sets a day. Place the elbow of the affected arm on a flat surface, for instance a table, and lift your forearm straight up. Slowly bend one finger at a time to touch your palm, holding for 5 seconds as each finger is fully bent. Do 10 repetitions for 1 set. Do 3 sets a day. Trigger finger, medically known as stenosing tenosynovitis, describes the condition of trying to straighten a bent finger, but having it catch or lock temporarily before suddenly, and sometimes painfully, popping straight. Tendons are strong cords of fiber that connect muscle to bone. When a muscle contracts or relaxes the tendon, due to its attachment to the bone, causes the body part to flex or extend, that is, bend or straighten. Tendons are kept in place next to the bones by a protective tunnel of tissue called the tendon sheath, through which the tendon slides. The sheath is lined with tenosynovium, a lubricating substance that helps the tendon move smoothly. In the hand, the particular tendons involved in the movement of the fingers are flexor tendons, which extend from muscles in the forearm through to the bones of the fingers and thumb. They run along the underside, or palm side, of the fingers. The tenosynovium lining the tendon sheath can become inflamed and thickened through repetitive use or due to a condition such as rheumatoid arthritis. This may cause the available space through which the tendon must slide to narrow, making movement of the tendon more difficult. If this happens and the smooth sliding of the tendon is hindered by constriction at the mouth of the tendon sheath, there can be a sticking or catching before the sudden release and straightening of the finger. Each time the tendon catches, it worsens the inflammation and eventually bumps, called nodules, can form, and permanent thickening and scarring of the sheath can occur. This sets up a vicious cycle of more catching, more inflammation and more swelling. It can be experienced in more than one finger simultaneously, and sometimes both hands are affected. If it is particularly severe, the finger may become locked in a bent position. It is more common in the dominant hand and the thumb, middle or ring fingers are most often affected. Trigger finger is caused by the thickening of the tendon sheath and the resulting inability of the tendon to slide smoothly through the restricted space. Certain conditions may predispose people to develop it. Being between 40 and 60 years old. Having diabetes, rheumatoid arthritis, hypothyroidism or tuberculosis. Straining the hand through repetitive or extended gripping. Musicians, people who work with power tools, or industrial workers are the sorts of people who might be at particular risk of developing trigger finger. Trying to straighten a bent finger or thumb but having it catch or lock before suddenly shooting straight. Pain with snapping or clicking sensation on bending or straightening the finger. Tender lump at the base of the affected finger. Finger possibly getting stuck in a bent position. Stiffness in the finger, especially after inactivity; better after movement. Your doctor will take a medical history from you, and perform a physical assessment. You may be asked to move your hand in certain ways so your doctor can determine what causes difficulty of motion or discomfort. A simple physical examination is usually sufficient for diagnosis, and x-rays or other tests are not needed. Treatment for a trigger finger will depend on the severity of the symptoms, and how long you have been afflicted. Mild cases are usually successfully treated with non-surgical methods. Resting of the affected hand for 4-6 weeks will normally cure the condition. Altering your activities to avoid any repetitive gripping motions will allow the hand to rest. Massage will relieve pain, but will not reduce inflammation. Soaking the hand in warm water in the morning, when the catching is worst, may ease symptoms. This can be repeated throughout the day if it is found to be useful. Doing finger exercises are good at maintaining flexibility in the finger. Splinting the finger for 6 weeks. For symptoms that are more severe, you may be advised to take NSAIDs (non-steroidal anti-inflammatory drugs) such as ibuprofen (Advil) or naproxen (Aleve). These work to lessen inflammation, which may reduce the constriction in the tendon sheath, making it easier for the tendon to slide smoothly. Painful symptoms would therefore be relieved. A corticosteroid injection can be administered to the tendon sheath, which also reduces inflammation. These can be very effective, but are sometimes not suitable for people with certain medical conditions such as diabetes or rheumatoid arthritis. A medical procedure, known as percutaneous trigger finger release, can be performed to release a locked finger and is usually very successful. Moving the finger soon after surgery is recommended to avoid stiffness in the joint. Performing these exercises will help improve range of motion, flexibility and strength in the fingers. Be guided by your health care professional as to when you can start doing these. With your good hand holding the affected finger or thumb, gently bend and straighten the finger as far as it will go, without forcing. Repeat 10-15 times. With the palm of your affected hand facing the floor, hold the trigger finger with your other hand and gently stretch it up towards the ceiling as far as it will go. Hold the stretch 5-10 seconds and then gently stretch it down towards the floor. Repeat the hold and then release. Do this 3-5 times. Gently squeeze a rubber ball, hold the squeeze for 10 seconds, then release. Repeat 10 times. As strength in the hands builds, you will be able to squeeze harder. A splint may have to be worn for several weeks, so a comfortable fit is important, snug enough to prevent movement but not so tight as to be constricting. Construction that includes ventilation for the skin will help to prevent sores. You will probably be able to remove the splint when bathing, just make sure that your skin is thoroughly dry before putting the splint back on. Avoid activities that involve extended gripping, if possible. Keep your hands and fingers strong and flexible. Ulnar deviation, also known as ulnar drift, is a progressive deformity of the hand caused by the swelling of the metacarpophalangeal joints (knuckles), which results in the fingers bending towards the little finger side of the hand while the wrist bones deviate towards the thumb side. The primary cause of ulnar deviation is rheumatoid arthritis, although other conditions such as systemic lupus erythematosus or psoriatic arthritis may also be responsible. Very rarely, synovitis can also cause the condition. Your doctor will look for signs of heat and swelling around the wrist and knuckle joints and will gently palpate (touch) the hand and wrist to test for tenderness or pain. You will be asked to carefully move your wrist and hand to determine range of motion, strength, and grip. The doctor will also be ruling out other conditions while these tests are performed. Crushed ice, in a bag wrapped in a towel, will help to reduce the inflammation and therefore the pain. Ice can be applied several times a day for as long as is comfortable. Placing a warm, damp cloth to the hand, while the hand is stretched as far as comfortably possible, will help to increase stretch. Ultrasound or Transcutaneous Nerve Stimulation (TNS) may be used to reduce pain in the joints. Wearing a soft splint at night, and when the hands are painful and swollen, will keep the fingers properly aligned and allow motion at the knuckles. Research does not show that wearing a splint will help correct the deformity, but it can improve hand function and strength. Exercises will help to maintain flexibility and strength. Severe ulnar deviation may require surgery to relieve pain and improve hand function, although improvement in movement would probably be limited and grip strength would not be improved. While the joints are inflamed, stretching exercises should be avoided so as not to risk overstretching and tearing delicate tissues. With your fingers gently stretched in front of you, bend the fingertips and middle finger joints (DIP and PIP joints) and slightly bend the knuckles (MCP joints). Keeping the DIP and PIP joints bent, straighten the MCP joints. Hold the stretch for 10-30 seconds. Repeat 3 times. Place your palm flat on a table and hold a pencil on the thumb side of each finger in turn. Keeping the pencil in place, push against it with your finger. Hold for 6 seconds. Repeat 5-10 times. Place your palm flat on a table. Extend your thumb and 'walk' your fingers towards your thumb. Place your palm flat on a table. Slowly bend your hand toward the thumb side. Hold for 10 seconds then slowly bend your hand toward the little finger side. Hold for 10 seconds. Repeat 5-10 times. Ulnar neuropathy means damage to the ulnar nerve. The ulnar nerve is one of the three main nerves that travel down the arm. It originates from the spinal cord in the neck, passes down the length of the arm and provides sensation to the little finger and half of the ring finger. It also controls most muscle movement in the hand. The ulnar nerve can be damaged anywhere along its length, but the most frequent place is where it passes through the elbow. Another vulnerable area is where it passes through the wrist. In the elbow it goes along a groove and through a narrow channel, the cubital tunnel. This groove, anatomically known as the olecranon notch, can be felt just behind the bony protuberance on the inside of the elbow. If you have ever experienced the sensation caused by hitting your elbow on your ‘funny bone’, you have momentarily compressed the ulnar nerve as it goes through this channel. It is vulnerable to damage at this point as it lies between skin and bone and is not protected by muscle, tendons or fat. It is also stretched every time the elbow is bent. At the wrist, the ulnar nerve travels through another narrow channel known as Guyon’s Canal. Due to the limited space available, the nerve is vulnerable to compression at this point. Damage to the ulnar nerve, if not treated, can result in muscle wasting (atrophy) in the hand that can be permanent. There are many ways of damaging the ulnar nerve. If the injury is in the elbow, simply leaning on the elbow too much might be the reason. Excessive bending of the elbow might overstretch the nerve, or it might be compressed by the swelling of tissues near it. With some people the nerve naturally moves out of the olecranon notch when the elbow is bent, which, over time, could cause irritation. A previous, surgically repaired, injury to the elbow might have changed the anatomy enough to abnormally press on the nerve, or the neuropathy might be a result of a wider problem, such as diabetes or alcoholism, both of which damage the entire nervous system. These symptoms may be intermittent and may only be noticeable when the elbow is bent, or during the night. Your doctor will ask you about your medical history, your general health, lifestyle, and normal activities. You may be asked questions about the way you sleep, as the position of your elbows during sleep can affect the ulnar nerve. You will be asked about your current symptoms, their onset, severity, and duration. Your arm will be physically examined, moved and touched in specific ways to help with the diagnosis. Your neck and shoulder will also be moved to see if different positions produce symptoms. Your hand will be tested for sensitivity and strength. Although X-rays will not show the ulnar nerve, one may be ordered to see if there is a physical reason for the neuropathy such as a bone spur, arthritis or a cyst. A nerve conduction test might be performed to determine the location of the damage. Nerve impulses are electrical and take a certain amount of time to reach their destination. Measurements taken at different points along the arm can reveal abnormally slow nerve activity, which would suggest damage at that point. Most nerve damage heals by itself with conservative (non-surgical treatment), so if your injury is relatively mild, conservative treatment would be the initial course. Treatment would consist of wearing a padded splint or brace over the elbow or wrist, depending on the location of the injury, with the padding placed over the olecranon notch of the elbow, or ulnar side of the wrist. This would protect the nerve and prevent overstretching it. You could take anti-inflammatory pain medication, such as ibuprofen, to help with your symptoms. Steroid injections are not recommended for ulnar neuropathy as they can damage the nerve further. If the pain is too severe, if conservative measures fail, or if muscle atrophy is significant, surgery can be performed. Most surgical procedures for ulnar neuropathy are done on an outpatient basis, that is, you would not have to spend the night in hospital. If the cause of your neuropathy is that either the cubital tunnel or Guyon’s Canal is too narrow, the constricting tissues can be surgically released. Scar tissue would then form, healing the tissues and providing an enlarged space through which the nerve could pass. Occasionally it might be necessary to move the ulnar nerve from the olecranon notch to a position where it is protected and can no longer be leant on or stretched when the elbow is bent. This procedure is called an ulnar nerve anterior transposition. You would have to wear a splint for a few weeks post-operatively, and physical therapy in the form of exercises would help you regain flexibility and strength in your hand. The results of treatment for ulnar neuropathy are normally good. Nerve regeneration is slow, so recovery can take some time. If the nerve compression was particularly bad there may be some residual damage, in which case any muscle atrophy would be permanent. Your physical therapist or doctor will advise you about rehabilitation, but the exercise below may prevent stiffness in your arm and wrist and ease symptoms. Hold your arm straight out in front of you. Keeping the elbow straight, curl your fingers and wrist towards you then stretch them in the opposite direction so the wrist is bent away from you and the fingers are pointing to the floor. With the fingers still extended, bend the elbow. Often, a thumb is injured as a result of a fall or other situation where the thumb is subjected to an extreme force that pulls it away from the palm. Ligaments that normally hold the thumb bones in position at a joint can be stretched or torn, causing an injury that can range from a mild strain to total dislocation of a thumb joint, particularly the joint at the base of the thumb. You can see that the thumb is deformed, or the swelling is severe. After you have rested the thumb for an hour, it still hurts. You are unable to bend the thumb completely. When you try to move your thumb, the pain is extreme. You experience any numbness or weakness in your hand or arm. When you try to make a pinching motion, your thumb feels weak at the base. Any of the above could indicate a serious injury that will need medical treatment. Your doctor will examine your thumb, and may order X-rays to determine the type and level of injury. Your treatment will depend on the findings, but will often include immobilizing the thumb for a length of time. Rest the thumb by immobilizing it. You can splint it with tape or rest your hand in a sling. Preventing movement will decrease the risk of further damage and allow the injured soft tissues to begin healing. Ice will help to reduce inflammation and swelling, which in turn will relieve pain. Hold a bag of crushed ice (wrapped in a towel) against the injured area for as long as is comfortable, several times a day for the first two or three days after the injury. Elevate the thumb above the level of the heart. This will help to minimize swelling. Take over-the-counter pain medication, according to the directions on the pack. Your doctor may recommend that you wear a thumb stabilizer or spica while your thumb heals. Thumb ligaments are notoriously vulnerable to re-injury, so using a stabilizer or spica can be a sensible precaution to take. Although they wrap around the wrist and extend up the thumb, holding the base of the thumb securely, they do allow you to use the rest of your hand normally. Velcro fastenings on the wrist and thumb adjust for comfort and support. What is a Wrist Extension Brace? The wrist is an intricate arrangement of joints formed by the junction of the two bones of the forearm (the radius and ulna) and three of the eight carpal bones that make up the base of the hand. The carpal bones are in two rows, linked by the scaphoid bone. Ligaments connect the bones, keeping them in the correct position when flexing or extending the wrist and limiting the extent of movement in order to safeguard the structure. Any heavy fall or sufficiently forceful trauma can wrench the wrist beyond its normal range of movement, and result in a sprain or fracture. In fact, it is quite uncommon to sprain a wrist without broking a bone at the same time. In order to heal fully, wrist joints need time. Bones must be immobilized, and the movement of the ligaments restricted. Some other conditions and disorders that may require temporary support of the wrist include carpal tunnel syndrome, arthritis, de Quervain's tenosynovitis, tendonitis, tendonosis, and more. Using a wrist extension brace (or splint) helps reduce discomfort by stabilizing the wrist in a neutral, optimum position. There is a bendable, spoon-shaped structure against the palm that is held in place by adjustable hook and loop fasteners. A malleable stay for the back of the hand (dorsal stay) to improve stability is sometimes an optional extra. Extension splints tend to be made from a stretchable, washable neoprene (or airprene, which is breathable for increased comfort) material. A larger strap that passes around the lower wrist provides extra stability and compression, and prevents the splint slipping towards the hand. The standard length of a wrist extension brace is 8 inches, while the extended version is 10 inches. A regular extension splint ends below the knuckles, which allows unrestricted movement of the thumb and fingers. This makes it possible to perform most daily tasks while keeping the wrist immobile. Some models of splint come with a thumb support that limits extreme movement of the thumb joints. These can be helpful in cases of Gamekeeper's Thumb or other thumb conditions or injuries. Wrist extension braces come in a range of sizes based on the circumference of the wrist, and in left- or right-hand options. De Quervain’s syndrome is a type of tendonitis that affects tendons that extend across the wrist. Tendonitis is the term used to describe inflammation of a tendon and its surrounding sheath. Tendons are strong, dense cords of a connective tissue, called collagen, that attach muscle to bone. When muscles are contracted, the tendons pull on the bone, causing movement. The specific tendons affected in de Quervain’s syndrome are the extensor pollicis brevis, and the abductor pollicis longus. These tendons allow movement of the thumb. As a result of trauma or overuse, some or all of the collagen fibers that make up the tendon can become frayed or broken. Given adequate time, they will heal themselves, but if the muscle is not rested the tendon fiber cells are unable to regenerate and tendonitis can develop. The exact causes of de Quervain’s syndrome are unknown. However, it is known that certain repetitive motions can cause inflammation of the tendons. Actions such as gripping or pinching, or twisting the wrist, use the tendons mentioned above. Unsurprisingly, it is normally the dominant hand that is affected. Sometimes a trauma such as a direct blow to the area can cause de Quervain’s syndrome, but usually it develops gradually as a result of repetitive and excessive grasping motions. Rheumatoid arthritis is also known to provoke the condition. Interestingly, women, especially if they are between the ages of thirty and fifty, are up to ten times more likely to develop de Quervain’s than men. Resting. Avoiding the movements that cause pain gives the tendon fibers a chance to heal. Applying ice to the sore area. Using a splint or brace on the thumb and wrist to keep them immobile while the tendons heal. This can take up to six weeks of wearing the splint twenty-four hours a day. Thumb spica braces are appropriate, although a longer wrist brace can also be used. Using NSAIDs (non-steroidal anti-inflammatory drugs) such as ibuprofen or naproxen. If these treatments don’t work, your doctor may recommend a steroid injection, which helps reduce swelling and pain. This is often very successful at resolving the problem, and can be repeated if necessary. Surgery is a final option. Normally done on an outpatient basis, the surgeon opens the tendon sheath to relieve the pressure that has built up as a result of the inflammation. This allows the tendon to once again glide smoothly. It can take up to several months for any tenderness to completely disappear, but it is usually possible to return to normal activity within two to three weeks after surgery. Rehabilitation exercises are recommended, and techniques taught to reduce actions that place stress on the wrists. De Quervain’s syndrome is a painful condition, so anyone prone to inflammations of this sort would be wise to avoid the sorts of repetitive motions that can aggravate the tendons, or at least break up sessions into shorter periods. It would also be sensible to perform specific exercises regularly to keep the muscles strong and flexible. A contracture is the shortening of certain tendons, muscles or other connective tissues causing loss of full extension of the affected joints. A wrist contracture can be caused by scar tissue forming adhesions in and around the joint, which can lead to restricted movement and limited extension of the wrist. Hand and finger contractures are often caused by Dupuytren’s contracture. This progressive disease affects the connective tissue under the skin of the palm, the palmar fascia. The thick, strong, triangular fascia lies between the tendons and the skin, with attachments above and below, and extending to the fingers. As the palmar fascia thickens and shortens due to the disease, the fingers can be gradually pulled towards the palm and are unable to be fully straightened. The extent of the disease varies from person to person and is not predictable, although it is likely to be more aggressive if there is a family history of it, if you are male, if you are an alcoholic or suffer from epilepsy, if you have the disease in both hands, or if you have had surgery of the hand. It often occurs in both hands, with the ring and little fingers predominantly affected, and rare involvement of the index finger or thumb. Surgery or an injury always forms scar tissue as part of the healing process. If the scar tissue is in a position to affect normal movement of the wrist or finger joints, a contracture may result. The causes of Dupuytren’s disease are not clear, although there is a definite genetic component with 60-70 per cent of sufferers reporting a family history of the condition. North European, especially Viking, ancestry. Being male: Men are three times as likely to contract Dupuytren’s as women. Age: Onset of the disease is more likely between the ages of 50-60. The first symptom is likely to be small nodules in the palm of the hand, near the base of the fingers. These may be tender to begin with, but become painless with time. The skin might begin to pucker, and painless cords might be visible under the skin of the palm, extending to the fingers. When extending the fingers, the skin blanches, or loses color. Occasionally there may be tenderness of the knuckles on the back of the hand. At a later stage of progression, the skin and palmar fascia start to contract, pulling the fingertips towards the palm. It becomes impossible to fully straighten the fingers. Although all fingers can be affected, it is usually the ring and little fingers that suffer. There can be a gradual onset of the disease, or a rapid acceleration followed by a period with no further changes. Range of motion is restricted, and there is a reduction in normal hand function and ability. Your doctor will take your full medical history and perform a careful physical examination. If the problem is a wrist contracture, questions about the onset of symptoms are vital in order to plan the correct course of treatment. The physical examination will reveal any visible symptoms such as lumps under the skin, puckered skin or cords. You will be asked to demonstrate the range of motion of your wrist, hand and fingers, and your doctor will note any limitations of joint movement. You may be asked to do a Hueston test, which involves trying to lay your palm flat on a tabletop. If you are unable to do this, your doctor might consider this a positive diagnosis of Dupuytren’s contracture. Depending on which joints of the fingers are affected, you will be given a diagnosis of composite or fixed Dupuytren’s, and your condition graded from 0-5, according to the severity of the contracture. X-rays are used as a diagnostic aid for a wrist contracture, to view any joint damage, but not for Dupuytren’s disease as an ultrasound is more useful in showing thickened fascia or the presence of any nodules. There are two possible courses of action when deciding how to treat a wrist contracture. Which one is better depends on how mature the scar tissue is. If it is fairly recent, the most successful results can be achieved by wearing a splint on the wrist, and doing certain exercises to increase range of motion. If, on the other hand, the scar tissue is over three months old it is not possible to increase range of motion, so surgery is the better option. The aim of any surgery would be to remove as much scar tissue as possible in order to free up the joint, although it cannot be entirely removed and new scar tissue will form as a result of the surgery. Post-operatively, a splint would be worn continuously for 6 weeks, with gradual reduction of use over a few months, and the introduction of stretching exercises. For Dupuytren’s contracture, treatment used to consist of ‘wait and see’, and observation is still recommended if the contracture is not causing any loss of function. In other cases, early treatment offers some hope of managing the disease, although if the contracture is severe you are not likely to recover completely normal hand function. Needle aponeurotomy is a procedure used to separate the Dupuytren’s cords and restore mobility. This is performed on an outpatient basis and is preferable to surgery as it is less invasive and the formation of new scar tissue is reduced. After care includes wearing a splint for a few hours a day and not doing any sports or manual labor for one week. If required, surgery is performed to remove the palmar fascia. Recurrence of the disease after surgery is possible, complications may occur, and rehabilitation is lengthy. A splint must be worn continuously for six weeks, then at night for a further three months, gradually tapering off to being worn only at night. A physical therapist will probably make recommendations about the best splint for you, but you might want to consider a couple of factors. When a splint has to be worn for an extended time, comfort of fit is extremely important. A padded, adjustable splint would probably provide the greatest benefit. In order to avoid developing skin problems, it should be constructed in such a manner that your skin can breathe and remain dry. While athletes are more likely to suffer from injuries to the major muscle groups used in sporting activities, even the everyday office worker can be prone to finger, hand and wrist pain due to improper use or overworking of the joints. Wrist injuries and arthritis are so common in those who use their hands for a living, even if only for typing. No matter your ailment, MMAR Medical offers a comprehensive library of resources on finger joint pain, hand conditions and more to help you and your sports medicine professional understand what’s going on inside your hand and how to treat it. In addition to our wide array of wrist and hand bracing solutions, we hope the above articles, written by medical professionals, will help you on your way to a speedy and painless recovery. Contact us with any further questions about your particular condition and educate yourself today on how to rehabilitate your ailing hands. All material is owned by MMAR Medical.